It was over a month ago that I began hearing the ominous reports — that there would be a new “zero-tolerance” policy at the U.S.-Mexico border, that kids were being separated from their parents, and that under this new policy, more would be. I remember the cold feeling I had when I first read that news, on my phone, as my two young boys shouted and laughed on the playground in front of me. Since then, the details of the horror have been fleshed out: a four-month-old baby ripped from her mother’s arms while nursing, the mom handcuffed for resisting. A father so devastated he couldn’t save his toddler from this torture that he took his own life. Prison camps in the desert for tiny inmates. Photos of terrified toddlers, as those in power in our country tear their parents from them. But I no longer feel only that cold, frozen feeling. I am enraged. I am activated. And I am connecting with others in my community and across the country who are willing to do whatever we must to stop this cruelty and turn our country on a decisively different path. These signs get to an essential truth: This is a moral, existential crisis for our nation. It is the manifestation of a policy defined by cruelty toward the vulnerable and dehumanization of anyone not in the inner circle. It grows directly from the methods used not only by the Nazis, but also during the time of slavery and the genocide of Native Americans. And it is the fruition of the toxic tree planted by this administration, the next step in cruelty that follows attempts to strip young people of DACA status, cut healthcare and nutrition from kids and families, and make a short-term profit by poisoning the earth our kids will inherit. Now, any illusions are stripped away. Ripping babies from their parents and caging them cannot be done by mistake. It is not like accidentally stepping in front of someone in line at the store. It is not a disagreement over policy. It is deliberate, pre-meditated torture of those most vulnerable. And make no mistake, if we allow this to happen to some kids, the guarantee that it won’t happen to everyone’s kids becomes frail indeed. But there is another force in our country. It is the force that we have seen after disasters like the recent wildfires — the force of people coming together to help each other in times of crisis. It is the force of deep love and limitless drive to protect that parents feel taking care of their children. May the depth of that love be a force that drives us to break from our “normal” lives and face down the rising forces of cruelty governing our nation. We must make sure that border separations end, and that every separated family is reunited and receives medical and psychological resources to cope with the trauma inflicted by our own government. We must make sure that this administration and those who are enabling it never have power to govern again. Each of us must step out of the business of our daily lives and find a way to get involved. Join the national day of action planned for June 30. Join local Facebook pages under the banner Families Belong Together that can connect you to other activists in your area. Organize everyone you know. Donate. Get arrested. Vote and support others to vote. It up to all of us to find a new way forward — as a nation, as a society — that grows from the love we have for our children, and treats all of our kids with the kindness and fairness they deserve. Carolyn Norr is the mom of two young children and lives in Oakland. 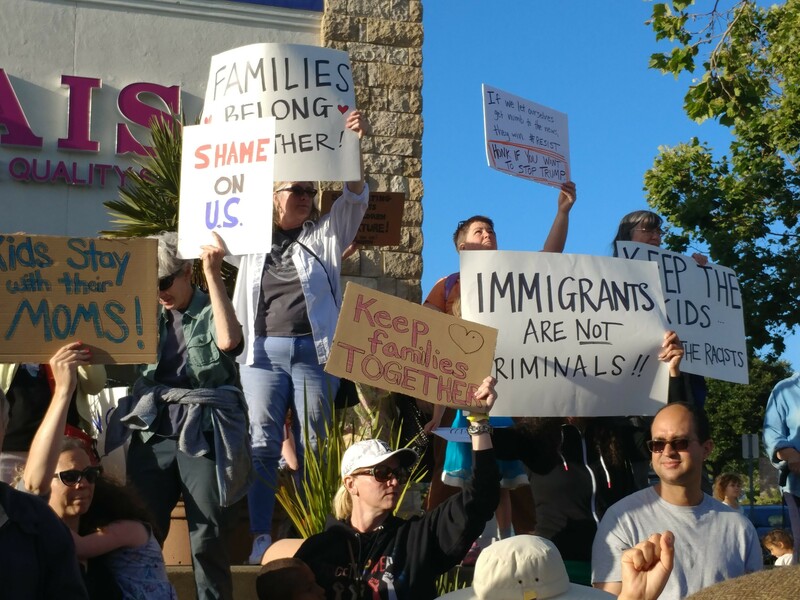 Connect with her organizing efforts on the Families Belong Together East Bay Facebook page.